In the past maternity bathing suits were quite difficult to find and they were pretty dull. Since then the designers recognized the need of pregnant women for pregnancy swimsuits. In our days it is quite fashionable to show your tummy. When shopping, you should only think of your comfort. These swimsuits focus on the belly instead of hiding it. This is a really good thing because women should be proud of their belly during pregnancy. During this time women have to enhance all the positive features, such as the larger breasts and the round curves. You should find a swimsuit that is comfy throughout your entire pregnancy. Two of the most important factors regarding pregnancy swimsuits are ease of fit and comfort. Women shouldn’t feel constricted by their swimsuit. There is no reason for pregnant women to try to use their old bathing suits. They just make it more difficult for them to breathe. In order to be comfortable in the maternity bathing suits there are three areas of the body that need support: hips, bust and tummy. For the support of the bust you should look for soft and molded cup bras. If you have large breasts, you should have an underwire bra. However, it is possible that the bathing suits for maternity that have an underwire are too tight for the tender and sore breasts. If you take swimming seriously you should be thinking about the shelf bras. They don’t offer too much definition, but they offer good support. Keep in mind regarding the maternity bathing suits that during pregnancy the breasts usually get enlarged. This is why you shouldn’t get a bathing suit at the beginning of your pregnancy that is already too tight. If you are concerned about the support offered, you should also think about the straps. If your breasts aren’t too large, you could get halter style bathing suits for pregnancy. In case you need more support, you should consider tank tops or tops with wide straps. No matter what style you choose, you should go for the adjustable straps so that you will be able to adjust their length. Flexibility is also important when it comes to maternity bathing suits. This is why you should test this characteristic. Look for the stretchy materials, such as the ones that come with lycra. In some cases the side ties of the suits can also be adjusted. When it comes to the tummy, you just have to make sure that it has place to grow. Although some women still prefer the skirts when it comes to swimsuits for pregnancy, the professionals say that the tankini is a lot more suitable. It gained a lot of popularity because women can mix and match the tops and bottoms. Another advantage is that going to the bathroom is no problem with a two piece. Now you know more about the maternity bathing suits and you know how and what to choose. 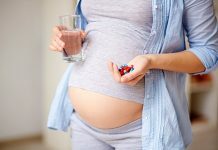 What Kind of Pain Killers Are Safe During Pregnancy? Missed Your Period? 6 Early Pregnancy Signs And Symptoms To Look For!